When Governor Brown made his big water announcement in April 2016, the focus was on mandatory reductions for residential and commercial water uses; prior voluntary efforts largely had failed. What followed his announcement, unintentionally, was an attack on agricultural water use in California. There is a general misunderstanding of where our water is used in California. Of the water supplies available for all uses, fully 51% is dedicated to environmental purposes such as wild and scenic rivers, habitat, fish flows, and managed wetlands (source: CA DPR). This is a very significant amount of our water supply that is utilized to maintain our state’s environment for the benefit of man, animal, and plant. Where the confusion starts is in only reporting water use for developed purposes … meaning consumer and residential water, commercial business operations, and of course, agriculture. 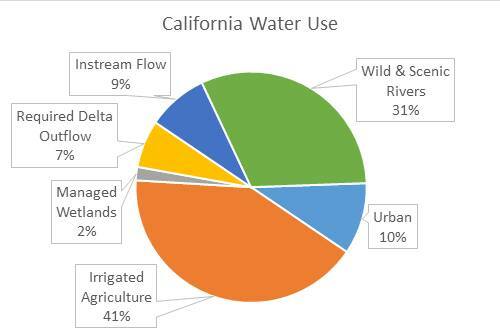 Here we see that of the remaining 49% of our water supply, agriculture uses 80% of that ‘category’ of water. Translated, that means about 40% of the TOTAL water supply, with 10% used in residential and commercial uses. Continuously the media states that Ag uses 80% or our water supply to produce food and other crops, as well as animals. 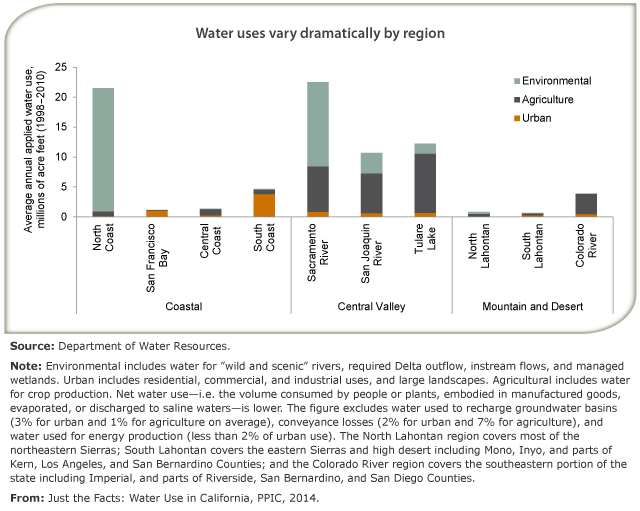 This distorts the true picture of ALL our water supply use in California, conveniently excluding the largest portion of water resources available in our State. We, as citizens, have chosen to dedicate a majority of our water supply to environmental purposes through noble efforts to restore the California Delta system, protect fish runs to ensure survival of various species, and restore habitat for migratory birds and other wildlife. These are defined beneficial water uses that have impacted the available water supplies for other beneficial uses, the consumer and the farmer. Public outcries about the forced residential water cutbacks have demanded that farming needs to also take a hit. Well, that hit has been ongoing since 1992 when the first accord was implemented for environmental water use in the Delta region. Since then, there has been a steady erosion of available water supplies to farms and ranches all around California. in April 2016, the State Water Resources Control Board issued notices of curtailment to post-1914 groundwater water right holders in the San Joaquin watershed, including many farming operations. Today you can look out and see that over 500,000 acres of productive farmland has been fallowed, with more to follow if the trend continues. Meaning, no food is being produced, the land is bare dirt. Agriculture has suffered through the four years (2012 - 2016) of drought as the FIRST beneficial use to take a cut in supply. Today, we are facing a prospect that many farmers in the Central Valley will again this year receive ZERO water to maintain their fields and orchards. Focus now is on groundwater pumping, the unintended consequence of taking away the surface water deliveries promised to Agriculture when the Federal and State water projects were built many decades ago. Those projects supplied water to the fields so groundwater pumping could be avoided … and there was ample supply for Agriculture until we started diverting these water supplies to environmental purposes. Farmers that two decades ago were chastised for growing cotton during a drought made decisions to convert to nut tree crops, to demonstrate that more water efficient high-value crops could be grown. Ironic now that those very farmers are now being chastised for growing nut tree crops when they made a significant effort to improve their environmental footprint long before it was a cultural movement. We all need to decide if food production, domestically, is our primary mission. We can chose to force crop choices upon farmers and import more food staples, but we will be giving up one of our most productive and diverse food growing regions of the world. California leads our nation in food production, and indeed is an economy unto itself as the leading producer of crops such as leafy greens, broccoli, strawberries, olives, artichokes, pistachios, avocados, wine grapes, cauliflower, citrus and more ... it’s a long list. We are fortunate in the Salinas Valley to have developed our water resources over the past seven decades, to the point where we don’t depend on any other water supplies other than our own. Is the system perfect? Not yet, but we are making progress. Farmers locally have stepped up and invested in resource projects and irrigation efficiency technologies that have utilized 9% less water to produce 45% more in value over the past 20 years … that’s a big step in the right direction. And a lot of foresight! So, if we all like to eat and enjoy the local bounty daily, we should all be willing to make agricultural water supplies a high priority. It takes water to grow food. Water is value-added to our food. Daily.